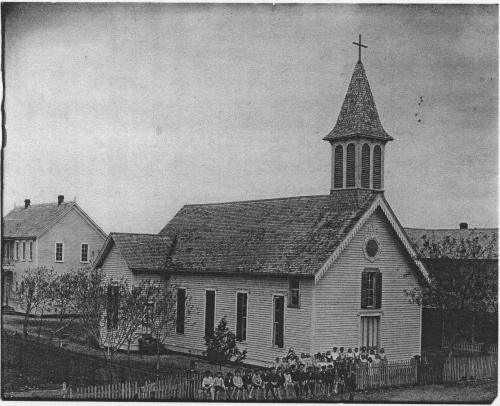 The history of St. Mary of the Visitation goes back over 127 years to 1885 when a tiny structure was erected just three blocks from the current location. A small, four-walled wooden frame was moved from Seguin TX and rebuilt on the original site. The Vogel Lumber Co. constructed and donated the first altar. That first location was so simple and without conveniences that worshippers had to kneel on the bare wood floor; benches came later. Masses continued uninterrupted for many months. The parish was to become known known as St. Ignatius. The Lockhart High School Freshman campus now stands on that first location. Unfortunately, there are no known images of that first little chapel. A second location was purchased for $125.00 at the corner of Church and Bois d' Arc streets. Construction began in April of 1887. By September, walls and roof were up. The first Mass was said before completion on November 5, 1887. Easter of 1888, the first High Mass was celebrated. The dedication took place on October 7, 1888. Disaster struck in the predawn hours on Sunday June 30, 1918. A fire of unknown origins destroyed the church and the rectory. Consequently, a fourth church and third and current location was purchased and cornerstone laying ceremonies took place on Sunday, December 29, 1918. In keeping with a promise to the Blessed Virgin for special favors received, the pastor at the time a Fr. Zuber, renamed the church St. Mary of the Visitation. It was completed in time for Easter Masses in April of 1919 and dedication took place on May 11th. A colonial style brick rectory was added in 1950. That building now houses the church offices. 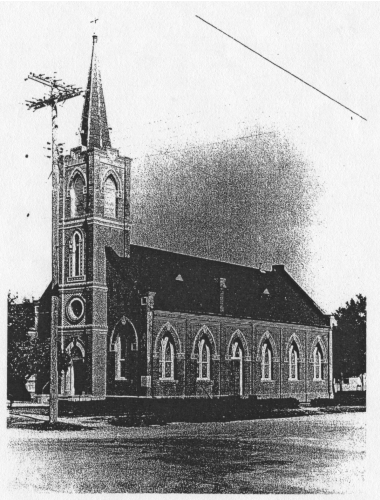 By 1953, the parish had outgrown the church and plans were made for the now standing building. The parishioners voted to have a church building that matched the style of the rectory. Groundbreaking took place on March 20, 1955 and construction completed in May, 1956.